As I’ve previously written, last October the wife and I spent a few days in Palm Springs with 5g Aviation as sales reps for a true anachronism: American Champion, a domestic company that actually manufactures things. ACA builds a line of two-seat tailwheel aircraft which are direct (albeit highly modified) descendants of the the classic 1940’s Aeronca Champ. I’ve been weak in the knees ever since I saw 5G Aviation’s fire-engine red Super Decathlon in the Parade of Planes on Oct. 10. So, I headed straight to the exhibitor outside the Palm Springs Convention Center to inquire. For $175,000, the base airplane would be mine; plus, I’d purchase two $1,995 training sessions from them to finish off my tailwheel endorsement and take an unusual attitude recovery class. Knowing that AOPA’s magazine has a circulation of around 400,000, it seemed worthwhile to see if we couldn’t trade some time in the Decathlon for a bit of publicity. The print edition is supplemented by an electronic version, a web site, and a weekly newsletter. That’s a lot of opportunity to connect with the target audience. Even if only 0.001% of the readership took a serious interest in the Decathlon, it would still represent 40 prospective customers. In a 21st century aviation ecosystem where prices are sky high but volumes extremely low, the math here is compelling. My original idea was to focus on the virtues of the Decathlon, especially with the Xtreme version so close to FAA certification. As it turned out, the needs of the magazine were somewhat different. They wanted material for their “training & proficiency” section, so we elected to focused on completing Alyssa’s tailwheel endorsement. It certainly doesn’t hurt to achieve a professional goal while also reaching a personal one at the same time! As any experienced tailwheel instructor will tell you, the technique for landing a tailwheel and nosewheel airplane are the same: round out low, keep the nose straight, and hold it off the ground until it’s ready to touch down. Then keep the plane pointed in the same direction it’s traveling while it slows to taxi speed. 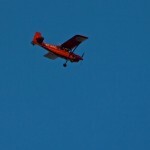 Because the techniques are so similar, tailwheel transition training quickly reveals how well the student learned to land during primary training, even if it was done in a nosewheel aircraft. As such, it’s not uncommon for me to spend more time on remedial flying technique than on tailwheel-specific stuff. Typical areas of deficiency include coordination, control confusion (using aileron when rudder is required or vice-versa), crosswind correction, and drift control. In Alyssa’s case, however, I didn’t see many of those issues. She recently received her instructor certification and had a bit of tailwheel time in the Citabria and Husky, so she quickly picked up the required skills. In the video, you’ll hear her talk about how it took 7 hours and 44 landings before she was done, but it’s worth mentioning that she would have been done sooner if not for the challenging conditions at John Wayne Airport during her training. It’s uncommon to get “real” crosswinds out here, but while Alyssa was in town we experienced several days of gusty, direct crosswinds of up to 20 knots. The wind changed direction, allowing her to see what landing with a tailwind felt like. It rained. We flew two lessons in the dark. I put her in the back seat for one flight. Controllers kept reversing the runways. And of course SNA is famous for wake turbulence and jet blast issues from the many Boeing and Airbus airliners which come and go on a continual basis. In addition, we completed a spin flight and spent extra time getting video to accompany the print article. The weather conditions presented an interesting situation. While they were a fantastic training opportunity, they also extended the total time required to finish the endorsement. That can be deflating for a student who expected to reach proficiency more quickly. While I would have felt comfortable signing her off at least a couple of hours earlier, the gusty crosswind left Alyssa feeling like she wasn’t “getting it” even though she was flying in weather she probably wouldn’t tackle on her own quite yet. The extra time was helpful in allowing her to get the icing on the cake: confidence that she really could keep the ground loop at bay. I was impressed by the quality of the resulting AOPA article and accompanying video because it shows what a proper tailwheel transition program looks like. Alyssa also noted one of the most important things about it, that the skills developed during this training can be applied to any aircraft regardless of landing gear configuration. I’ll leave you with a gallery of photos from an air-to-air shoot we did with Jessica Ambats when 5g’s demonstrator arrived on the west coast. Operating a business jet appears quite unlike formation flying… but I’ve learned the similarities outweighs the differences. 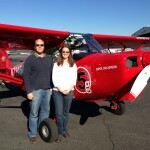 A quick “we did it!” photo after Alyssa completed her tailwheel endorsement. They did a lovely job – hopefully you will see much interest from their exposure. The photos of the aircraft are just beautiful as well! Watched their entire video as they included it in AOPA Live as well, so even better! Congrats for all the exposure! Thanks, Brendan. 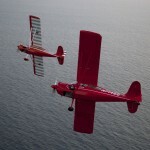 Yes, between the article, video, and the AOPA Live, it’s been getting quite a bit of play. It has been interesting to see how the publication process works. Think of the print magazine, the online edition, turbine edition, blogs, newsletters, etc. They turn out a lot of material! I saw the AOPA tailwheel video and encouraged my daughter to watch it. It is very well done. I’m a CFII and I’m checking her out in my airplane (a Cessna 140). I wondered, how are you demonstrating those ground loops? Glad you found the video instructional! I do the ground loop demo in a large open area (a runup area is ideal) and have the student follow me on the controls so they can feel my inputs. If done right, they’ll see how ineffective the rudder can be once the momentum vector moves outside the main landing gear. Start by moving the plane forward at about 10-15 mph, then feed in full rudder. It doesn’t matter which direction. After a couple of seconds, I’ll neutralize the rudder and ask the student to notice how the turn continues to tighten. Then after a couple more seconds I switch to full opposite rudder and have them note that it is ineffective because the tailwheel is hard over. Steering is lost at that point. If you do it fairly slowly, the ground loop demo is harmless. But it’s easy for them to imagine what would happen if the aircraft were traveling at 40 or 50 mph — the momentum would be sufficient to tip over and hit a wing on the ground. The ground loop demo reinforces the importance of keeping the aircraft pointed in the same direction that it’s tracking. One important note: if you haven’t done this before, start out slowly. You don’t want to cause any damage to your airplane while demonstrating it. Another great instructional trick is to have them taxi the airplane in a figure 8 pattern. It will require a fair bit of foot dexterity to start and stop all those turns right where they want them. If it’s windy, it’s an even greater challenge!